Gossip Guy: Just 'cause I feel bad for for my cheap shot at Man Bangs last week, I'll give it to him for informing his dad orange was out of style. It was cute and got a laugh out of us both. Mister Meester: Damien, after Eric's comment about recruiting virginal drug mules, replying that he'd ask if he's available, but he's gotta run. He was great last night. DANdy: The show saved the best, funniest and perhaps most subtle for last: I laughed out loud when Chuck bid everyone farewell with "So long, friends... Dan." 2. Which is looser, Lily's morals or Ostroff Center security? Gossip Guy: Hidden option three: Serena. Mister Meester: Lily has no soul. Even if you can defend what she did and consider Ben collateral damage in her quest to help her daughter (and that's a stretch), she lied to Chuck's face. Multiple times. This is her late husband's son, a young man who loves her and looks to her as the only family he has. That's what really struck me. DANdy: Pretty sure Serena volunteered herself as the answer here when she admitted to sleeping with multiple guys in the same night, multiple times. 3. Was Serena right to let Juliet off the hook? Gossip Guy: Definitely. I don't see what the big deal is. All the girl ever did was drug her and leave her in an unsavory neighborhood after withdrawing her from an Ivy League college and possibly ruining all her close relationships. Mister Meester: I think she handled it well. Not only did Serena sympathize with Juliet and Ben, she likely realized her own role in his demise. She didn't sign an affidavit, but her behavior contributed to the gossip Lily used to ruin him. DANdy: Yes. Two wrongs don't make a right, remember? Or, in this case, 67 wrongs, a few questionable decisions, dozens of confusing twists and a handful of flashbacks don't. PUBLIC ENEMY #1: Lily messed with the wrong Basstard(s). 4. Will Jack help Chuck save Bass Industries? Gossip Guy: Without a Blair to receive in payment? I doubt it. Mister Meester: Jack has been an awesome character from the start, with his only drawback being inherent - he's been at odds with his nephew, who everyone loves. Just imagine the evil machinations of Bart's brother and son working together. If I were Lily, I'd grab the keys to the Lincoln Hawk van and just peace out of New York now. DANdy: Absolutely. These two might not get along, but they have one thing in common: unabashed greed. When it comes to revenge, these two won't be Bassful about how they go about reclaiming what is rightfully their family's. 5. Blair and Dan: Should they get it on?!?! 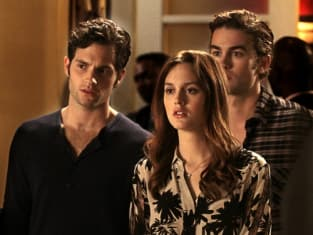 Gossip Guy: Could you find a bigger Dair fan than me? I'm sure some of you joined the dark side with me when you saw how cute they were on their road trip. Plus, there's no aphrodisiac like French documentaries about orangutans. Mister Meester: Do I want to see more Dan and Blair adventures? Absolutely. That was some of the funniest banter of the season so far, and even grew sweet by the end as they reluctantly agreed to hang out by choice. Sexually, though? I don't see it ... yet. DANdy: No way. I'm putting a ban on any Ban talk right here and now. Even the thought of these two in the same movie theater grosses me out. BONUS: What do you think Vanessa was up to this week? Gossip Guy: Hopefully wearing raccoon makeup and starting a terrible band. I think that's what happens when your character gets banished. Mister Meester: Sending out letters seeking grants to study climate change in the Maldives. Seems like something Vanessa would be interested in, and if she misses the last flight out before the ice caps melt and the ocean engulfs that island nation, no big deal. DANdy: Her eyeballs in uselessness!